Yesterday I headed down I-95 for a visit with Cristina, who has been very busy with her dyepot and knitting needles getting the goods ready for the needlework table at the Waldorf School of Philadelphia’s Holiday Crafts Festival this weekend. I’m no slouch. 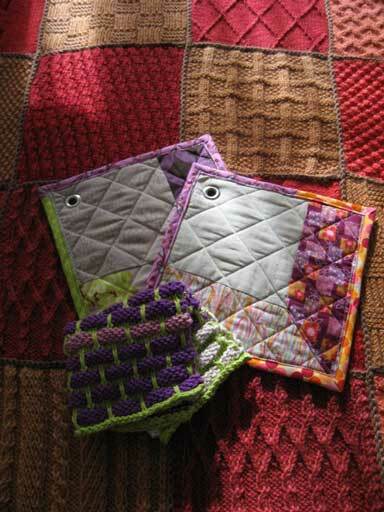 With the help of my assistant Elio, I grommeted potholder number 2 myself. 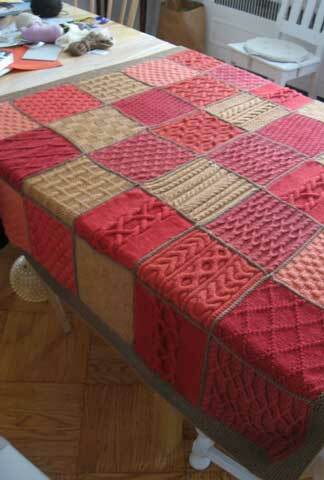 It worries me, a little, to remember how long we laughed when somebody said, ‘Pig on blanket!’ You see, we were sewing up handknit beasties for the Waldorf School fair. You had to be there. Oh. The blanket? You want to see the blanket? Cristina was the headmistress of this blanket. 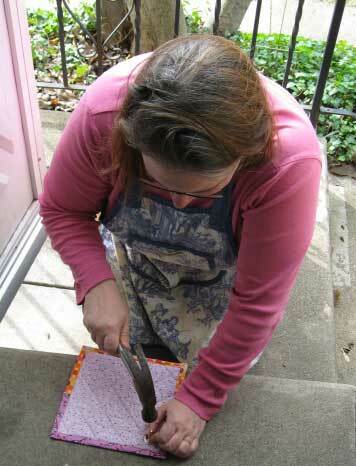 She organized volunteers to knit squares from undyed wool. Then, many twigs, stems, and bugs were stewed in Cristina’s kitchen to dye the squares. Unusual smells issued forth, no doubt deterring trick-or-treaters. Cristina joined the squares using the 3-needle bind-off on the right side. 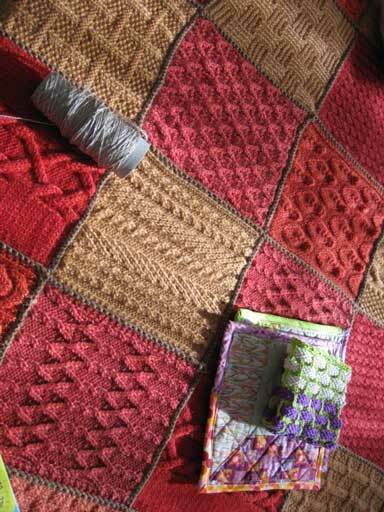 Many of the stitch patterns come from Barbara Walker’s Learn-to-Knit Afghan book. The blanket is being raffled off at the festival to benefit the Waldorf School of Philadelphia..
Philadelphians: you know what to do. Act now. You have to be in it, to win it. 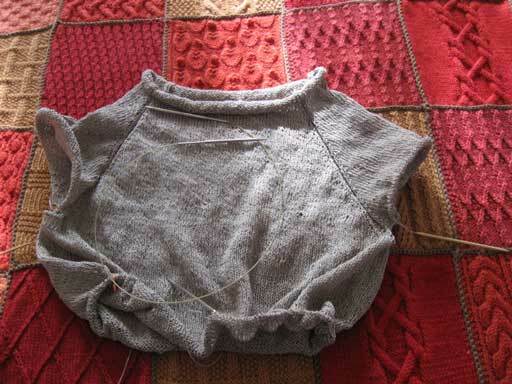 Lady Raspy, my top-down raglan pullover in Euroflax Sportweight linen, is well on its way. Sadly, I did have to cannibalize yarn from my Knit 2 Together skirt. Hey. Only the strong survive, you know? I want Lady Raspy to make it, and if I have to gnaw the ruffle off of a skirt, so be it. 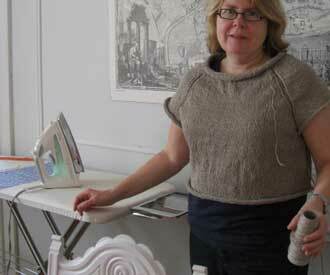 Here we see our model wearing Lady Raspy at the one-cone point (and isn’t that a fine specimen of an iron). This is 200 grams of linen yarn, which as you can see, goes a good long way. I’ve misplaced the original Raspy pattern. Freak not! NOT A PROBLEM. I counted the stitches around the bound-off neck of Original Raspy (aka Raggy Raspy) (aka Are You Really Wearing That, Like, Outside?). Then I cast on that number, and then, using Barbara Walker’s excellent Knitting From the Top to guide me, started knitting. First the rolled neck–a snap. Then I selected my method of increasing (oy! Barbara! too many choices! you’re killing me with the choices! ), had fun figgering out how to create the impression of Original Raspy’s raglan seams (K1 through back loop, p2, K1 through back loop), and knit some more. After a while I tried it on. It seemed like unless I wanted to divert to Poncho Land, I would soon need a hole through which to put each arm. So I put the sleeve stitches on spare needles, cast on a few stitches under each arm, joined up the body stitches, and started going around, gently decreasing, for my gentle waist. (So very, very gentle. The Rembrance of Waist Lost.) Soon a few increase rounds, and the body will be done. So far, a very pleasant thing, this top-down pullovering. Shocking confession: I did not swatch. I am innocent of all knowledge of what gauge I am knitting. Whee!!!!! It fits when I try it on. All I need to know. This friendly fellow from Santa Fe, Martin Rutte, who co-wrote one of the Chicken Soup books! Martin’s book is Chicken Soup for the Soul At Work. Spirituality at work is Martin’s area of expertise. Isn’t that something? Kay! Where did you get that coned linen yarn? I MUST HAVE IT! Some blanket!! Beautiful. How is it put together? Crocheted, three-needle bind off? too much goodie goodness in one post, and a pig on a blanket to boot! lovely, lovely, lovely. This post made me laugh out loud over and over again… the funny just kept on coming. Beautiful things! The blanket truly is terrific, the sweater is beautiful, and the grommets look too fun for words. Nothing like taking a hammer to a carefully handmade object! gorgeous blanket… can we put in phone bids? 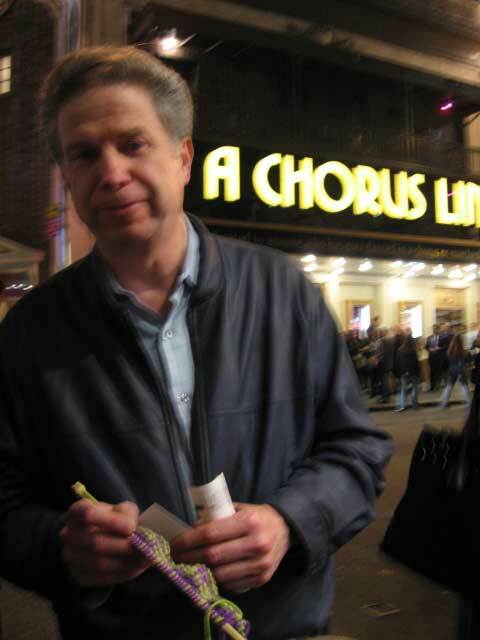 I see that you’re a barbara walker fan too. Ithink Raspy in Linen will be a great sweater and very wearable. That is a most gorgeous blanket! And such adorable pigs! Could you share the source for the piggy pattern? The ears got to me and now I’m dying to make one for myself. My favorite part, “WEEEEE!” Ah, the freefall of swatchless knitting. So funny this whole post was. Like Yoda I speak. Yup, nursing again. Thanks for making my humble Rowenta look so Eingebauten with your The Price Is Right modelling. 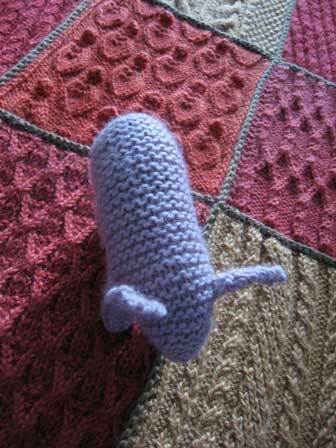 Kay, I was emailing with a buddy yesterday about six degrees of knitter separation but this almost takes the cake! I was to a conference on Prince Edward Island at the end of August and Martin Rutte was one of the speakers. In fact, he spoke at a fairly intimate session that I attended and, afterward, he picked up his pen and signed a book just for me. Then, two and a half months later, he held your knitting. 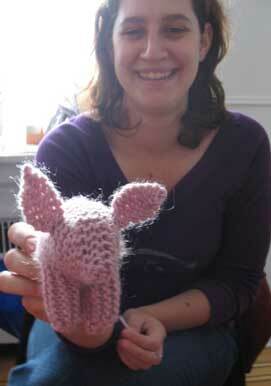 I’m so impressed at the magic of the six degrees of knitter separation. I mean, if someone said there was only one person between you and I, I never would have guessed that Martin Rutte was the one! PS: I heart Bill Nighy! I just don’t have the words for that blanket. I’m terribly impressed. And Barbara? What a gal! I know I’m enjoying my first top-down design using her book. She makes you work, but it’s worth the effort. Home-grown raspy is lookin’ good. Kay, if you haven’t seen it already, run, don’t walk, to your video store (or Netflix) and rent “Still Crazy” — a movie made in 1998 that stars Bill Nighy along with Stephen Rea (swoon! ), Timothy Spall, Jimmy Nail, and Billy Connolly. Bill Nighy is fabulous in it! Also appearing is a handsome young actor named Hans Matheson who was born on the Isle of Lewis. I swear he has to be related to Alice Starmore (whose maiden name is Matheson) — he looks so much like other members of her family. I can’t be the only one who squealed with delight over your Charlotte’s Web references. furthermore that blanket… fully envious and utterly gorgeous! The blanket! It’s MAG-NI-FI-CENT! If only I were a rich Philadelphian (sadly, I am neither of these things). Heather, I also squealed at the CW references. Maybe it is a Heather thing? That blanket is a thing of absolute beauty. And oversized ears are definitely a prime factor in deadly cuteness. Me, too, Heather, and Heather! And on with six degrees from there: Charlotte’s Web‘s author E.B. White’s Elements of Style; Mrs White’s (a New Yorker, of course) own book, Onward and Upward in the Garden; her correspondance with Elizabeth Lawrence, one of the best Southern garden writers of the twentieth century, published in Two Gardeners: A Friendship in Letters…. and here we are, back at our own Mason-Dixon-crossing literary team. Thanks for the great post, Kay! I believe I spied Raspy in the grommet photo…do I win a prize? And oh, the loveliness of that blanket! Mmm. Ahhhh, so much to gnaw on in this missive. I don’t even know where to start, so I’ll just go off in the corner and ponder a) that blanket; b) those grommets; c) the pigs; d) the tragic yet unavoidable loss of your linen skirt; e) the endless coolness that is Cristina. And f) that blanket again. And g) Elio, the fella. Love the blanket! “Learn to Knit Afghan” book is on my Christmas wishlist. Seeing the finished product makes me want to start NOW! Was a certain brand of wool used, or just whatever the knitters felt like using? Should bring in big bucks. I love the land of no-gauge. Too many people are a slave to it. In my opinion, it only impedes progress! My goodness so many Heathers! Beautiful blanket…I love the stiches and the colors. Where did you get the coned linen? 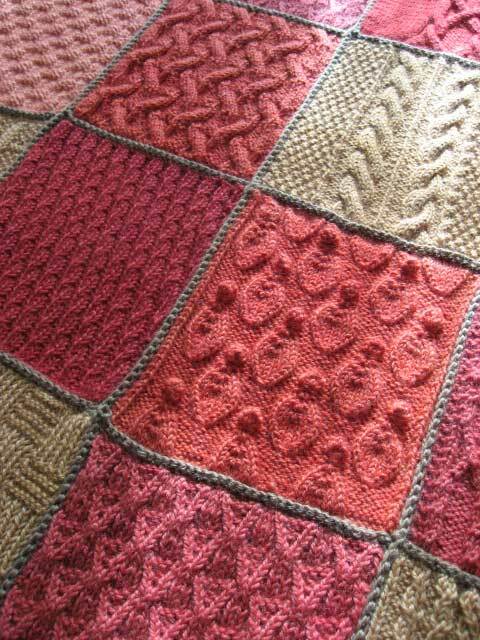 “Cristina joined the squares using the 3-needle bind-off on the right side.” How? How did she do this? I’m making my Chuppah for my wedding, and I had friends knit squares and soon it will be time to join them together. This seems like a good solid way of doing that, but how do you do it when all the sides are bound off? Is a crochet hook involved? Where can I find more information?! I love you SO MUCH for invoking Charlotte’s Web! that afghan is just lovely! and i especially like the way it was seamed together. great idea. 1. Kay, you are so cool to get out there and experience your city–and then to share it with us. NYC without having to fly to Newark and take a cab in. Thanks! 2. Grommets are so fun. And grommets in felted stuff–even cooler. 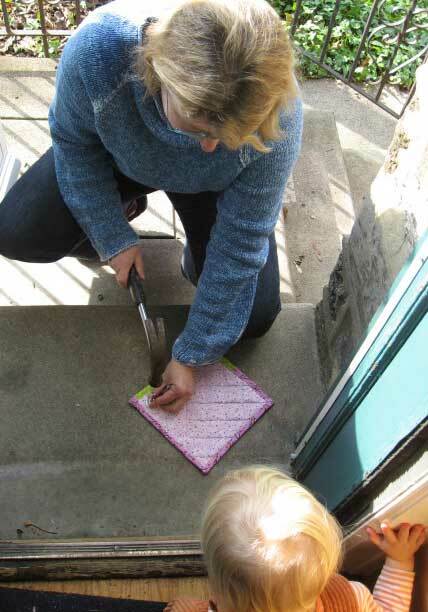 Everyone should get herself a grommet kit, a hammer, and a firm surface on which to wield a mighty whack. It’s a purge-and-a-half. LOVE Bill Nighy! If you haven’t seen The Girl in the Cafe, watch it pronto. So good! Am strangely fascinated by the grommets and am now looking out for items that need holes. soooo many good things in this post!!! 1. Cristina’s YARN?!!! I MUST HAVE IT!!! 2. she also posted about RACHEL-Marie’s YARN?! luckily she has an etsy shop. 3. You are wearing the RASPY!!! it looks nice and worn in and comfy on you! 4. the new raspy is looking even better than the first! love it. 6. could that afghan BE more beautiful?!!! so jealous. so. so. jealous. 7. THOSE PIGS!!! so cute. why isn’t the big ears a rule? it should be. 8. BILL NIGHY. love him. :o)so many great things, i tell you! ek. That blanket is STUNNING! Wow! It looks amazing and hopefully it will do its job and raise lots of money. Beautiful combination of colors as well. Well done. ooh, i rub my hands together at all of the new movies to rent. i don’t know who bill nighy is, but i will well nigh find out, nu? thanks, commenters! Thanks for posting the link to the craft fair. I live in Philadelphia and had no idea it was even happening! I’m so excited for it now! Thanks for the heads up on the play ~ I have tickets already for the 27th. GREAT blanket! So lovely and it looks like it was so much fun to get it together. There is just too much goodness in this post for a mere comment! Since I am in the middle of school-blanket-square knitting myself, I am completely bowled over by that blanket. How, I wonder, did she gather knitters who would do what she said?? Oh! I just got it! Belatedly – references to “Charlotte’s Web.” It’s getting scary how long it can take for the light bulb in my head to turn on. The blanket is so beautiful – what twigs? What berries? What bugs? I want to do that. I like the denim Raspy In Grommet Action shot. You really sell that sweater. And what a beautifully photographed post! Yesterday I feasted my eyes on the beautiful quilts of Gee’s Bend currently displayed at the De Young Museum in San Francisco. After dreaming of them all night I stumble upon this gorgeous version of the Learn to Knit blanket here this morning. It’s too much! Time to frog and restart my pitiful version of a log cabin. Thanks for the eye candy (pig on blanket included)! oh, how I love the grommet. love it. and bias binding. humph. my only trick is there are no tricks. I always machine stich one side and slip stitch the other by hand. . .my mom guilts me when I try it any other way. oh mom. I’m dying to know, like Cindy above, the details of this three needle bind off. Did she pick up stitches on the sides of the squares and then bind them off? I have a zillion afgan squares to connect and hers looks so nice. What a beautiful blanket!! I have been knitting various squares for a lap blanket for my grandmother and I think the 3 needle bind off would be the best way to put them together. (I HATE sew seams) Love the potholders. From Amy Butler’s book? It’s on my holiday list. I love the final tediousness (tediosity?) of slipstitching the back of a bias binding. It’s so…final…so…zen…so…much…like…knitting. My only trick is that I wear a leather thimble on the thumb of my left hand and a metal thimble on the middle finger of my right hand which greatly reduces the ouch quotient. What an afghan! What a sweater! Looks good in action! Only the strong survive is so true. I like to say it more like Shuck the Weak. I dunno where to start! I guess w/, I want to make that pig! Ah! In re: Feminist bores — and why are all knitters STILL considered grandmas? I mean, I don’t really care about being thought of as a grandma (though I’m not even a ma). It’s just the freaking sterotypical idea someone’s got in their head and they lazily use it to create their character. I LOVE the Raspy in action shot myself. PLEASE tell us how to achieve this beautiful 3-needle bindoff. Do you somehow pick up stitches going from right to left on both bits to be joined, and then do the bindoff next? I guess I could just experiment! Wow, I like bleached Raspy, but think linen raspy will be ever so elegant as well! That blanket is gorgeous, it must be painful to part with it, and oh, I have tix too, love Julianne Moore and Bill Nighy, sorry it wasn’t so good. So, so sad I missed this. So sad. Wonderful post. Will you also tell us where you found the pig pattern? I have several silent auctions and social services families to knit away within the next month and I can see that pig in many places. And of course, the blanket is gorgeous. But I know that will never happen in a month. So I will just drool. Whoops! You did tell us where to find the pig. Mea culpa, I should have read on. How do you recommend washing those dishrags, if you don’t mind me asking? I’ve knit a bunch, and the ones I’ve kept still smell…questionable…after several washes in my machine, with good detergent and a vinegar rinse. Any suggestions?